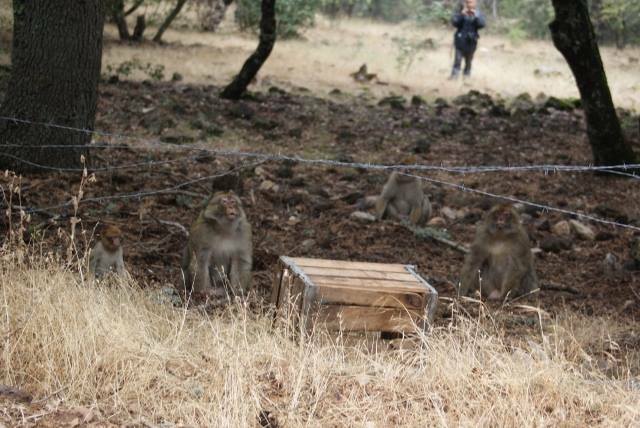 In 2012, four infants were captured from one of the study groups of the Barbary Macaque Project in the Ifrane National Park in the Middle Atlas. A number of NGOs, including BMAC, were involved in trying to locate these infants. As well as undertaking other collaborative initiatives with our colleagues at Direction Rif Eaux et Forets et al Lutte Contre le Desertification (DREFCLD), we co-signed a letter alerting the customs officials in charge of both the ports in our region to the possibility that the infants might be smuggled to Europe. 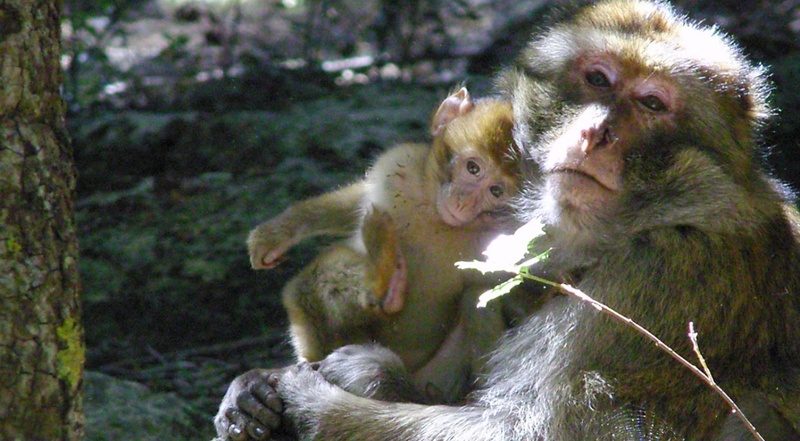 Indeed, about three weeks after the infants were reported missing, two female infant macaques, on their way to Spain, were confiscated by customs officials at the port in Tangier and DREFCLD were informed. 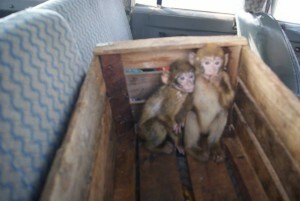 The two little females confiscated at the border by customs officials. Both females were in poor condition – dehydrated, very hungry and terrified. BMAC deputy director, Ahmed El Harrad collected them from Tangier, and immediately gave them food and water and transferred them from the cardboard box where they had spent at least 24 hours to a slightly more suitable crate. We hoped these infants were from the study group in Ifrane, but we could not be sure. We felt that there was little option but to try to integrate them into that group. The group showing great interest in the crate which contains the infants. Ahmed El Harrad travelled to Azrou, making contact with the park officials and with the students working for the Barbary Macaque Project. With the relevant paperwork in place, Ahmed, along with forestry representatives and the students, tried to release the infants. 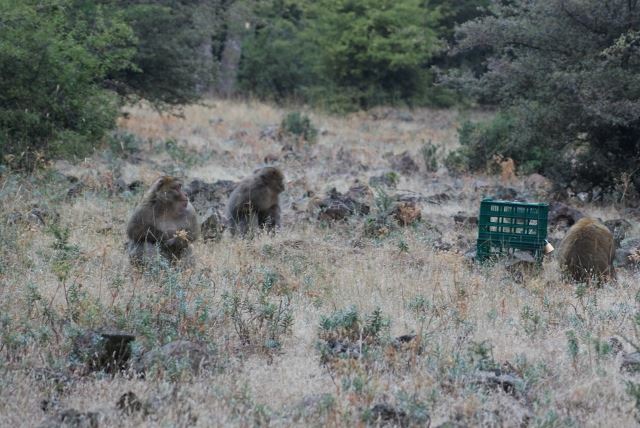 The wild male macaques were extremely interested in the infants but, as we feared, the infants had been away from a group for too long and were so terrified by the situation that they ran away. The infants were missing overnight in the forest and despite Ahmed locating one female the next morning, the other female was sadly never seen again. Teshta in the howdy cage and the group calmly sitting around her. Sian and Ahmed discussed the best way to try to get the remaining infant used to being a macaque again. Sian suggested trying some kind of “howdy cage” – a small cage used in the past to introduce captive primates to a new group. Ahmed made a cage out of two crates and took it to the forest. As you can see from the photo, the wild macaques were not afraid of the cage and spent time around it, and as Teshta felt secure she was not so stressed. Ahmed spent two days in Azrou and the students kept in touch with him during the days that followed. A few days into the integration, the students called Ahmed and told him it had been decided by others to send the infant to the Rabat Zoo. We advised patience as, in our experience, it sometimes takes some time for Barbary macaque infants to readjust to wild conditions. There was no space available at the zoo and, as we expected, Teshta acclimatised enough to be released from the howdy cage a few days later. She is now a part of a wild group and we hope that in time she will add her own infants to the group in Ifrane. Little girl with Teshta book. 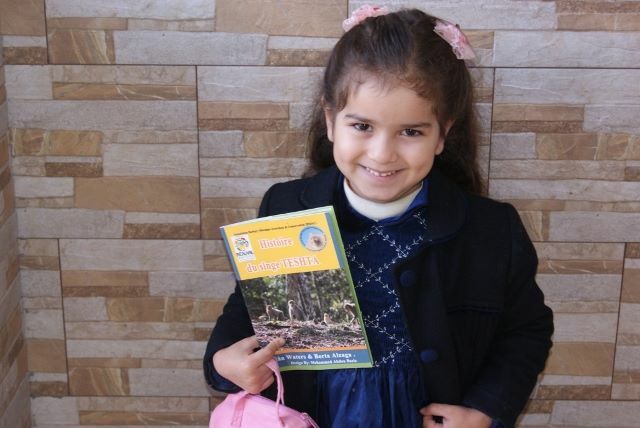 We turned Teshta’s story into a book in French and Arabic, which we have distributed in schools in Morocco and to interested supporters around the world. You can download a PDF of the book The story of Tehsta in our publications. Please contact us if you would like to support our work!